We have a perfect word that describes the way a woman prepares herself to look her most beauteous self-it’s called ‘solah sringaar’. It includes various aspects of dressing, right from the makeup to choosing the right accessories, and each aspect works like magic to create a spectacular spellbinding beauty. Sarees in themselves can make quite a difference to one’s look and may be chosen according to the occasion. The accessory though with their very simple or ornate touches can make even the most simple of sarees come alive with a new look and feel. Accessory choice should not be on the basis of what the saree looks like but the look that you want to create. Remember that if there is plenty around the neck and ears, it should be more frugal around the arms. Accessories are highlights and not the dressing itself! It’s fine to think of a truly beautiful accessory and choose a saree that goes well with it-it does work that way too! Here are some simple and easy to access accessories that can turn your look from drab to ‘diva like’! There is something about traditional accessories that makes it blend in most fantastically with sarees. Some amounts of caution of course would have to be practiced while choosing it as traditional sarees in themselves present a rather rich look and thus over accessorizing could be a pitfall one needs to watch out for. Bangles and kadas perhaps are the best deal for your rams but on special occasions, do try and team up the saree with another arm candy that is slowly gaining great popularity-the armlet. The armlet could be the kind that is slipped on to the upper arm or the kind that has a tassel fastening. A word of caution while wearing the armlet –wear just this or bangles that compliment its design and colour, and avoid loading up the arms with too many bangles. As far as the bajuband goes I would pick the one that has chunky kundan and a tie which has a pearl trim-these look fabulous with any color of saree. Yes, while the fragrance can easily transport you to another world it is the delicate beauty of jasmine that can enhance any traditional look of a saree. 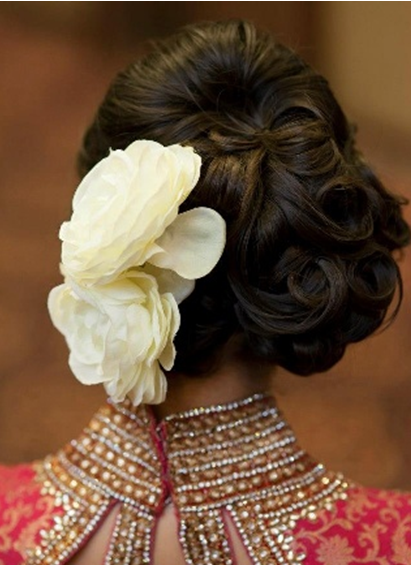 Wearing flowers in the hair instantly imbues the look with deeper ethnicity. Give this fresh floral accessory another twist -wear it on the hairdo, not alone, but in the company of tiny flower pins all along one side-or even with pearl judaa pins. Want the flowers looking fresh? 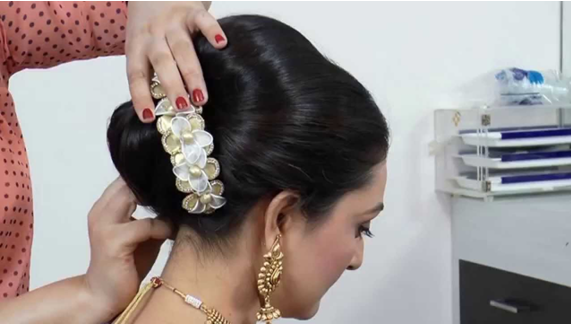 Here are two hair accessories that is inspired by the same tradition. Here an ancient accessory that has made huge waves in contemporary times. The aarsi or simply a mirror, was used by women of yore to look at themselves covertly as no mirror was available in public places. Aarsis were fitted into rings and women would simply use it to check out their faces! Clever –don’t you think? 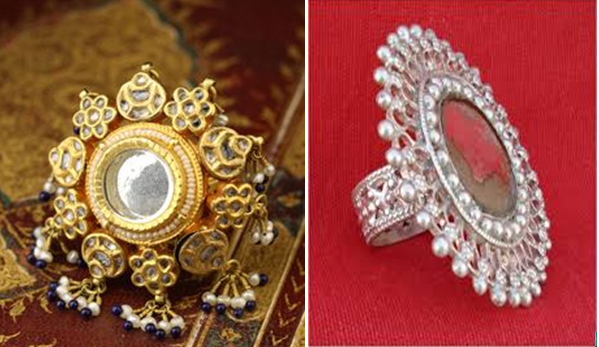 The comeback of the aarsi ring made quite some waves. They are generally fashioned out of silver and look fabulous. While your arm is a little heavy already with an armlet, you could wear a delicate watch with a pearl band on the other arm. Do remember not to add too many bangles to your arms, if an armlet is going to be your statement piece. 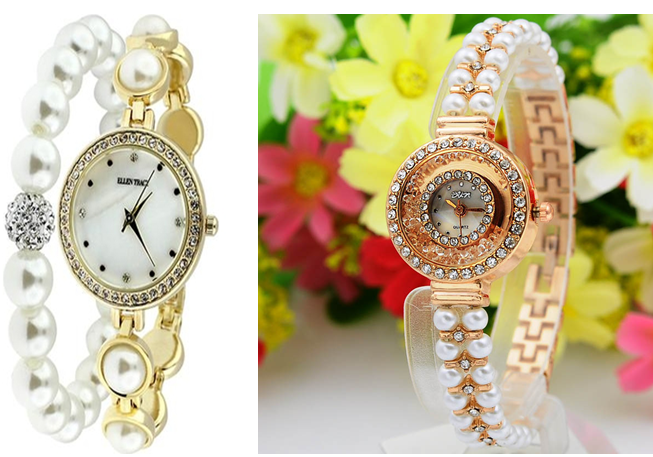 A watch in today’s times has become more than a timepiece coming as they do in scintillating new designs in mother of pearl finish and with bands that have meenakari work or pearls on them. If ever there was an accessory that strongly completes any saree, it would have to be the jhumka-be it the temple variety that is worn in the south or the simple meenakari and pacchi ones worn in the north and the west of India. Perhaps it is in the fluid lines of the saree, that the length of the jhumkas finds some kind of continuity. 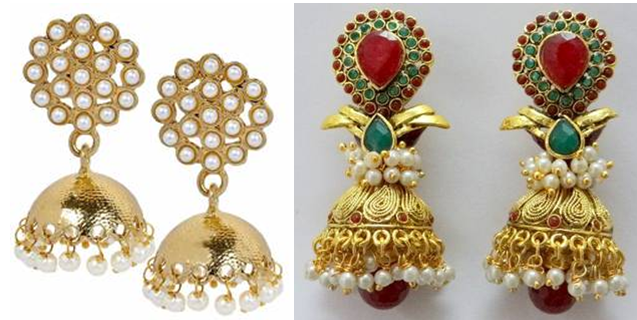 If your saree is a chiffon you could wear chandelier hangings and if it has a gold border opt for traditional jhumkas. The varieties are mind boggling and you are spoilt for choice! Wear stone work and silver with handloom sarees. Gold and meenakari look great with heavier more embellished sarees. Crystal and Swarovski look great with crepes, chiffons and georgettes. In case your earrings are large danglers- forego the neckpiece! While in most cases sarees as formal wear does not require one to carry a large purse, though a handcrafted silk tote with threadwork or kantha looks superbly ethno-chic, the best accessory for the evening, of course would be the potli. You find them in colours and patterns so great that one is tempted to keep adding more and more of them to one’s collection. It is imperative however to have either a gold potli with brocade work or a copper clutch for those very special occasions. Raw silk and brocade dominate the designs, most commonly. I’ve firmly believed that while the cocktail sarees like chiffons and diaphanous organzas would look fabulous with gold stilettos, it is the handmade kolhapuri chappals, that have reinvented themselves over the years, that will surely make your tootsies look their best. The latest versions come with wedge heels, some even with stilettos, and have tiny bells, gota and zari embellishments. A happy confluence of colour and gaiety on your feet and you are so very synchronized in every sense. Never should you end the happy look of a gorgeous gharchola or a bandhej saree with a pair of black kitten heels-that is pure sacrilege! Go for these truly desi footwear and make the right buzz! A simple shoulder pin given the most ethnic look can create the difference between a disheveled look of the saree and a neat in place pallu, done up in great style. Team it up with a pleat pin and a challa and you are completely in sync with this entire look of finesse. Try and use a brooch that coordinates with the rest of the jewelry. 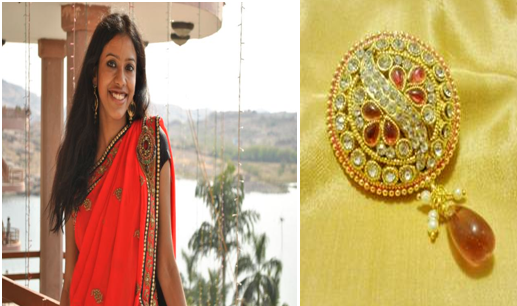 You could play around with the manner in which you do up your pallu with the help of a brooch. In fact add that brooch in case you happen to be wearing a sleeveless jacket with a shimmery saree. Pin it on the jacket while winding the pallu tightly round the neck as if like a scarf.